With the arrival of Victor Moses and the four other players that missed Super Eagles first training session in Uyo, all the 25 players invited for Saturdayâ€™s World Cup 2018 qualifying clash with Zambia trained at the Godswill Akpabio International Stadium yesterday evening. Moses, the Chelsea left wingback and his compatriot from the English Premier League, Alex Iwobi thrilled the evening session with quality skills. Moses Simon was also on duty to cause Technical Adviser, Gernot Rohr to heave sigh of relief. The Franco-German is believed to have excused both Iwobi and Victor Moses from the first day when the camp opened. Chigozie Awaziem and Ola Aina who also missed the first day were also on duty at the Nest of Champion yesterday evening. 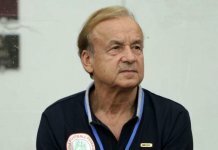 According to the teamâ€™s programme released to THISDAY Rohr and his wards are expected to train behind closed gates today before leading skipper John Mikel Obi to a session with the local media. Meanwhile, the Chipolopolo of Zambia touched down in Abuja from their training base in Ghana. They are scheduled to fly out to Uyo later today for the crucial Group B clash on Saturday. Coach Wedson Nyirenda has had three days in Ghana to acclimatise to West African geographical conditions and put together his team. Red Bull Salzburg striker Patson Daka, who suffered a knock in a league game in Austria on Sunday, is expected to team up with the squad in Abuja before the squad depart for Uyo. Coach Nyirenda who became very loquacious following Zambiaâ€™s home and away defeat of Algeria in the World Cup qualifier last month is going to miss the services of injured Platinum Stars striker Brian Mwila and Oostende midfielder Emmanuel Banda. Sweden-based Edward Chilufya also misses out due to his resident permit process that has yet to be sorted by his club Djugardens. According to information from the team’s camp, The Chipolopolo will have their first workout this morning before having a feel of the Godswill Akpabio Stadium in the evening. 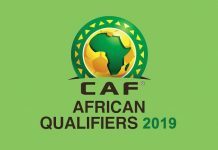 Zambia is three points behind Nigeria on top with 10 points – and a shock win will hand them a lifeline in their quest to reach their first FIFA World Cup.